The UMWA was the first labor union to negotiate retirement benefits for its members. 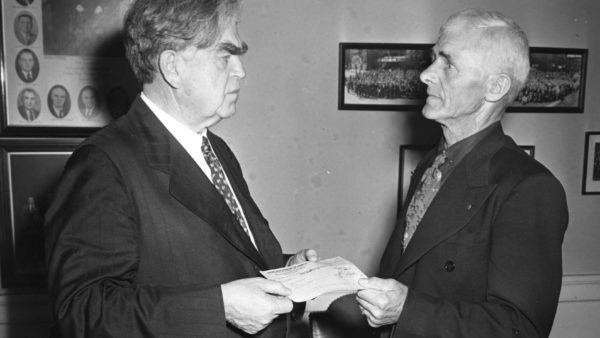 Through the historic 1946 Krug-Lewis agreement, UMWA members were promised health care and pensions in their retirement. The United Mine Workers of America Health and Retirement Funds (UMWA H. & R. Funds) was established in 1947 to administer pensions to retirees. Today, the UMWA H. & R. Funds provides pensions and medical care to just under 100,000 retired miners, widows, and dependents. The pension payments are a vital component of the rural economies of the coalfield communities, contributing over $613 million to the local economies. More than $514 million in medical payments from the UMWA H. & R. Funds goes to hospitals, nursing homes, doctors, clinics, and pharmacies throughout the coalfields, as well as over $100 million from retirement health care benefits provided by multiple employers through collective bargaining agreements with the UMWA. These payments are the bedrock of the medical care structure of those communities. For more information about the economic contribution of the UMWA Health and Retirement Funds in your state, click here. Did you know the UMWA Health & Retirement Funds is a separate organization from the union? If you are a coal retiree and have a question concerning your pension or your retirement health care, please call 1-800-291-1425 or visit umwafunds.org. To find out more about the creation of the UMWA H. & R. Funds click "more." Recently, the coal industry was hit with numerous bankruptcies and layoffs. This has severely impacted the UMWA 1974 Pension Plan. Right now, it provides pensions to almost 90,000 retirees, but there is now less than one active worker for every twelve retirees, meaning there are not enough contributions coming in to the Plan to keep it from collapsing in the near future. The United Mine Workers of America is leading the effort to pass legislation, the Miners Protection Act, to solve this pension crisis and preserve health care for some 22,000 retirees whose companies have recently gone into bankruptcy. To learn more about the legislation and how you can assist the UMWA in their fight to "Keep the Promise," click below.